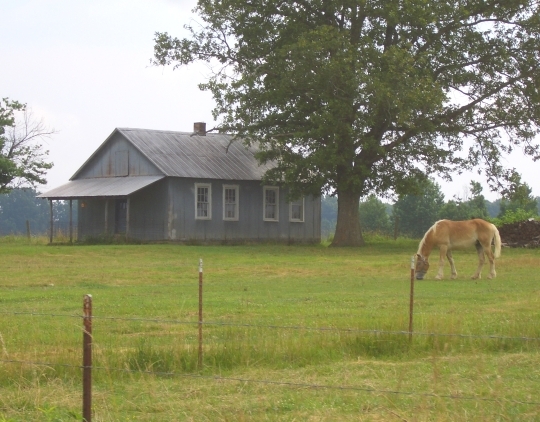 Last year I visited the Ethridge, Tennesse Amish community. I was surprised to find that Ethridge is the Amish mecca of the South. For being a conservative Swartzentruber community, the place is crawling with tourists (relatively speaking, of course. Lancaster County, this ain’t). It’s also a charming place to visit. It’s got a rural feel despite the oversized tour wagons rumbling about. I hope you enjoy the latest in the “10 views” series. Let me know your favorite photo in the comments! Want to know more about what I found at Ethridge? Here you go: The Ethridge Amish. You might also enjoy these photos from a related community: 10 views of the Hardin County, Kentucky Amish. Read more on Nashville Amish furniture stores. 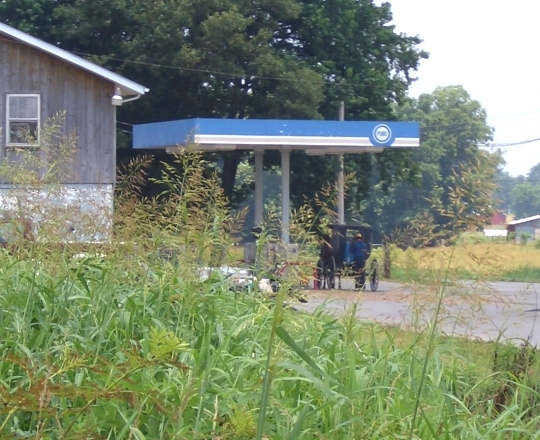 I like the buggy at the gas station, i wonder if hes filling a gas can for something?. Richard from Lebanon county’s Amish community. Richards comment; I like the buggy at the gas station, i wonder if hes filling a gas can for something?. Richard from Lebanon county’s Amish community. That jumped out at me, too. Got a good chuckle to start the day. Do you know what that new-looking big red building is? I don’t even know and I want to go in there and check it out. I always love pictures of homemade signs! We saw an Amish man filling a gas can at a Wawa in Gap, PA last fall … he was full of smiles and grins, taking in all the sights inside the store … such a dear looking young man. 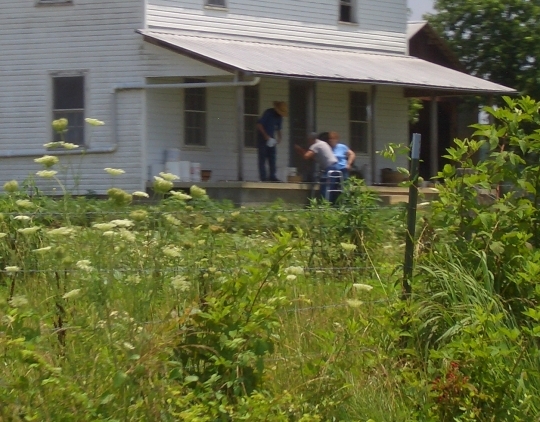 The Amish in this community often use kerosene in lamps and to run small generators and well pumps. Likely he was purchasing kerosene. They even shop at the local Walmart for some items. As for the new looking red building it was built for a young man who was newly married. It will be his workshop for furniture or wagon making. This is how he will make a living for his family. 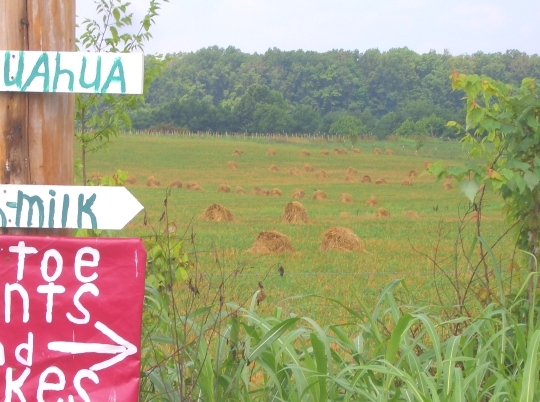 I love the picture of the hay drying in the field, with the sign in the corner. Gives you a country, peaceful feeling. However, I like all the pictures. How do they handle the tourists in smaller areas that aren’t quite used to it? It has got to be something that takes time to get used to. Especially being a more conservative group. Suzanna, actually, these guys are pretty well-adapted to tourists and English visitors. This is kind of what surprised me when I visited. I was there on a Saturday I believe, and you often saw vehicles parked on farm lanes, their owners buying something from the Amish who owned the place. In fact, the photos I have here I think sort of indicate how they interact with tourists–in the 5th photo you can see an English couple buying something from an Amishman on his front porch. 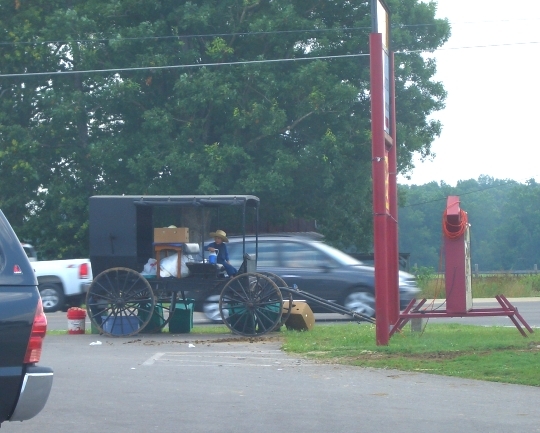 In the last photo, you’ve got one of two children that were selling goods off the back of the buggy at the Amish tourist center, near the busy main highway that cuts through the community. There was another guy just around the corner from them, doing the same thing. And of course the first photo–never seen such big tourist wagons! As I write in the original Ethridge post I did (linked above), the area’s Amish businesses are featured in a free map given to tourists. You’ve also got signs for businesses all over the place. Conservative they may be, but also pretty tourist-friendly. or you should be able to find the link to it if you look in the “Related Articles” just below the comment box. The red sided buildings are common with Swartzentruber groups. Some of them live in structures made of the same material. There’s another photo in the other Ethridge post (linked above) of a home with furniture shop attached. I really like the look–bright and sharp contrast (especially with the bright sun shining off the roof). Hi I m from michigan I live near a large community of troyer Amish not sure if you are familiar with them ?? They are a swartezentruber sub group I have severl pics I ve take of them over the years wouldove to share them ?? Is that possible to share them here with u all?? We don’t have a way for readers to upload pictures directly but you can email them to me. Hello, My name is Brad Berghof My wife and I moved to Ethridge,TN and we have several Amish Gentlemen And Women that worked for us on our farm. That being said we have a great respect for the Amish that worked for us we have found them very easy going and hard working. I know that a lot of people have the stereotypes of the Amish and I must say that they have their beliefs and if you talk with them and just find out their do’s and Don’ts They are some of the most respectful people around. So that being said if there is ever a time that you need help getting things uploaded to your websites we would love to help. I have some pictjres I d like to share of the trousers Amish in greenville Michigan could u please send me an address to send it to?? Thanks Erik for re-posting the Ethridge article. All these pictures are places I drive past every day. Wonderful, friendly, good people. We have just started our busy tourist season. All the fresh produce is beginning to come in. Lots of folks hungry for fresh vegetables! Every one needs to come visit. Right now they have the sweetest strawberries you ever tasted. yum! 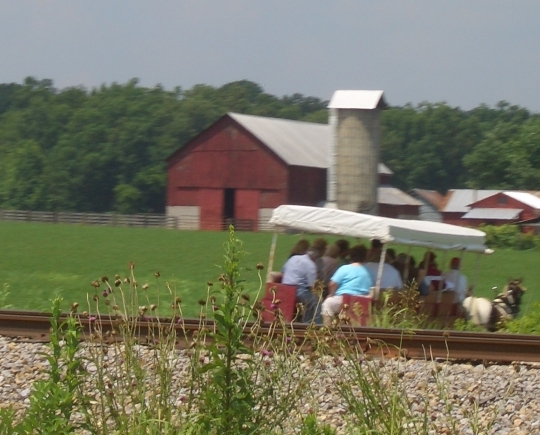 The folks at the Amish Welcome Center will give you a free map and directions out to the farms. A day in the country does the soul good. Thanks again Erik! I love your articles and the respectful way you write about these gentle folks. Thanks Erik, enjoyed the pictures, but couldln’t help but noticed all the weeds !!!! I just can’t people don’t cut their weeds…..it makes your place looks bad….. 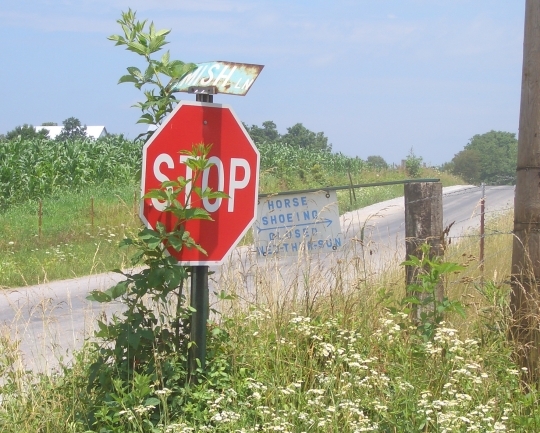 I like the one with the stop sign, the dirt road and the slight hill leading to somewhere “Amish” – my mind takes over and I can go anywhere in the dreams of what’s over that next rise? Over that next rise can be every other picture here … and then I get to visit each place. The possibilities are limitless! Mary I noticed that slight hill and the way it fades off as well…you don’t think of this things when you’re snapping, but it’s neat to see what the camera reveals afterward. Beautiful description! Mona, you are right, lot of weeds and overgrown areas here. I kind of liked that about it, however. It’s actually pretty typical of Swartzentruber homes–they are less focused on outward appearance and tidiness than some of the “weed-whacker Amish” as we might call them, with well-manicured yards. I do like to caption photos in most of my posts, but have sort of left the “10 views” photos without a caption, to let people fill in the blanks…maybe I should try it once though. I do enjoy hearing people’s reactions. 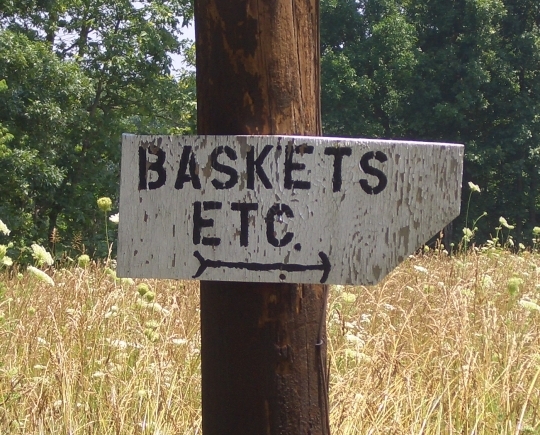 Ethridge is definitely on my list of Amish settlements to return to, soon hopefully. I love the pictures of the horse in the field and the one of the hay drying. Such restful scenes. them and comparing them to what I’ve seen in other Swartz. settlements in Hardin Co. Ky, and Orange Co. Indiana. Very similar. These Swartzentruber settlements definitely look different from the more progressive Amish settlements like Shipshewana. I’m wondering what the more progressive settlements looked like 60 and 70 years ago and if they maybe looked similar to the Swartz. settlements of today. I’M glad to see you also like the STOP sign photo, Mary. The new and old signs make a charming photo, well done Erik! The flowers in the foreground makes it a cheerful and peaceful scene. The 6th picture is a picture of oat shocks, not hay. (I have seen this error many times on the internet, and hope to correct it here). The green stuff in the picture either weeds, clover or both. The oats are the primary crop being grown. The shocks are stacks of 6 or 8 bundles of oat grain leaned together with one on bent over the top to help shed water. 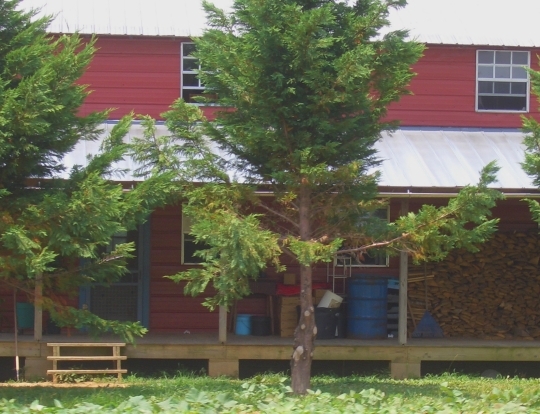 Since the field has not been sprayed to kill weeds, it is necessary to cut the crop and shock it to dry out the weeds before putting it in the barn. After 2 to 3 weeks, the bundles are loaded on a wagon and run through a threshing machine to separate the grain and straw. Often, it is very hot during threshing season. One time while I was doing that, a neighbor came up to us and said he was amazed we were working so hard. I knew it was very hot, but I was real surprised when he said it was 106 degrees. He said it was 104 the day before. We kept on working, but drank more water. Despite my hate for the heat, threshing was my favorite farming activity. The 3rd picture looks like a shop. 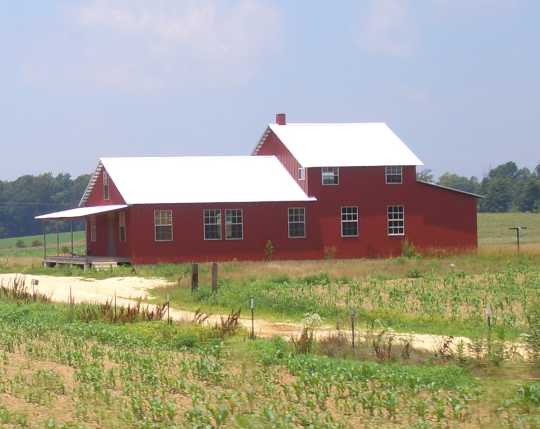 Often a young conservative Amish couple will build the shop before the house. They will then live in a portion of it for as long as it takes to get enough money to build a house. Usually there are several children born before the house is built. I like this picture best. Erik, have you ever been to the Scottsville, KY Mennonite community? The two church districts there are very conservative, as far as what’s allowed, but the people are exceedingly friendly. Their livelihood is quite dependent on the purchases from outsiders,…And from WalMart, who buys their enormous production of cantaloupes. Don’t want to take too much space, but I have a couple of interesting stories, if you’d like to hear them. Tamara, I’ve never been there, but please share–we’d love to hear them 🙂 I don’t have a post on that group but you’re welcome to right here or on any other post where you think it might fit. Thanks for the encouragement, Erik. I’ll chime in with personal experience where it seems appropriate. You should not take their pictures even though they don’t know you are taking it. It would be like giving a Jewish person pork without telling him. We should respect their beliefs. I like #7-that horse is beautiful!